I was lucky enough to have a fun day ticking classic steep lines on Mt. 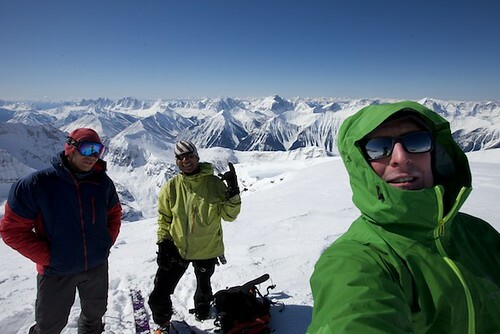 Stanley (3120 m) in Kootenay National Park a few days ago, with Joshua Lavigne and Ali Haeri. 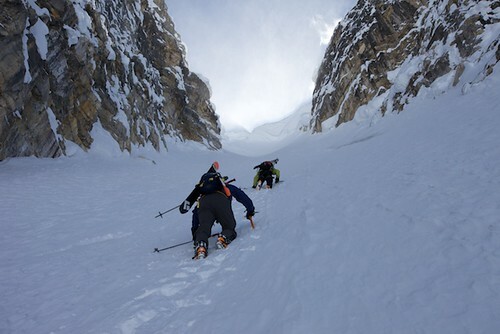 Great stability allowed us to take the exposed, direct approach to the Kahl face, aka the summer route, which traverses a hanging ledge above the ice climb Nemesis, and then goes up a steep bowl. Minus double-digit temps made for excellent conditions, and combined with both partners opting no not wear long-johns, perhaps anticipating warner conditions, made our pace extra fast during the early hours of the day, and we arrived at the summit only 4.5 hours after leaving the car. Stanley 0856 years ago ago by G3 Genuine Guide Gear. The day was crystal clear and visibility was unlimited. Our summit views extended beyond Mt. Assiniboine to the south, and all the way up the spines of the Purcells, Selkirks and Rockies, where we could pick out our favourite peaks in the Bugaboos and Rogers Pass Groups, and all the way up to Sir Sanford. Stanley 0896 years ago ago by G3 Genuine Guide Gear. 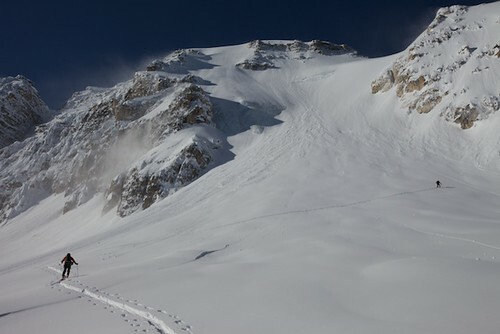 The decent of the NE facing Kahl route was nice and powdery, but care needed to be taken to avoid fast moving sluff that would take you out if you didn't let it go by. 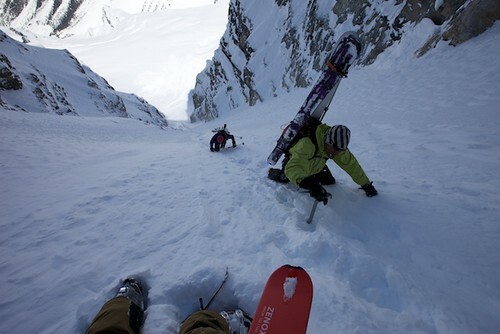 A bit of a crusty slope underneath also keep our speed in check, but nobody was complaining. 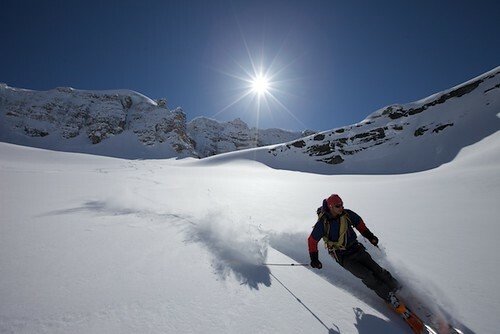 This had to be one of the more outstanding / classic faces of the Rockies, as skiing from often looked at summits, has to be one of the most satisfying feelings. Stanley 0906 years ago ago by G3 Genuine Guide Gear. Stanley 0956 years ago ago by G3 Genuine Guide Gear. Once on the glacier below, we took a good break in the sun before sliding over a few hundred meters, to below the Waterman Couloir. 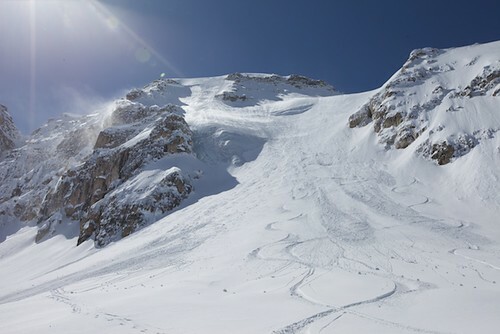 As it was still before noon, and temperatures were still cold, we couldn't resist attempting it, despite the 10 meter cornice hanging over it at the top. It was quite a bit steeper, with more variable snow than the slope we jus skied, but still felt in good shape. It didn't seem to take too long to kick steps to just below the cornice, where we very awkwardly clicked into our skis on the 55-60 degree slope. Stanley 0996 years ago ago by G3 Genuine Guide Gear. Stanley 1016 years ago ago by G3 Genuine Guide Gear. Stanley 1006 years ago ago by G3 Genuine Guide Gear. Big drops between jump turns soon eased off, as we made our way down,but the skiing remained challenging the whole way. Another super fun descent! Stanley 1056 years ago ago by G3 Genuine Guide Gear. 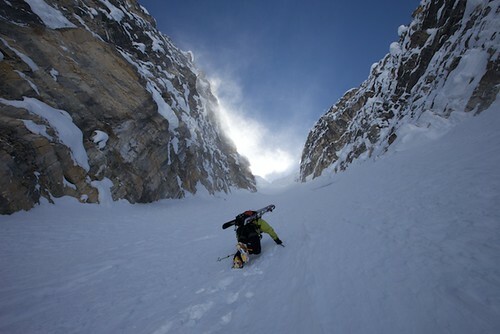 The Y couloir was the third obvious ski line on the North Face of Mt. Stanley, and we briefly considered adding it to the day. However, satisfaction had been achieved and our legs were feeling the 2200 m meters they had climbed, as well as the two strenuous descents. The hero pow on the sunny glacier was the more favourable option over doing something potentially sketchy, and we pointed our tips toward the glaciers tongue, and started towards the road. 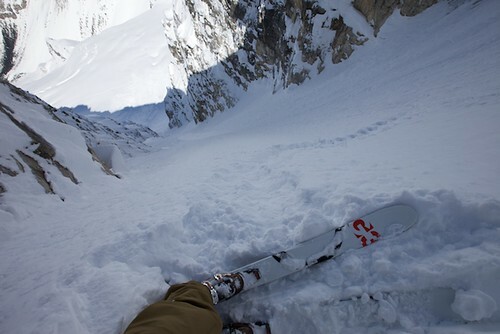 The powder eventually turned to perfect afternoon corn, which provided us with fun turns all the way to the road. A short while later over well earned beers in the bar, the "what's next" question started to get asked, as the steep skiing season of the Rockies was primed and ready. Stanley 1066 years ago ago by G3 Genuine Guide Gear. If you're recreating in the mountains near or far, odds are Jon Walsh has been there, and put up a first ascent or descent while he was at it. A true adventurer, Jon is renowned for his constant pursuit of new ice climbing routes, alpine climbs, big wall ascents, and unskied lines in the Canadian Rockies and beyond.